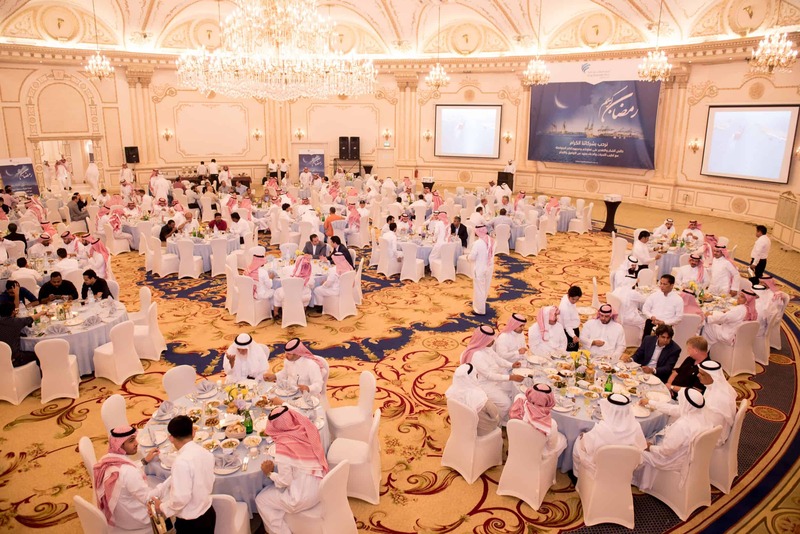 In a Ramadan setting filled with the faith, communication and collaboration that reflect the spirit of one family, the Ports Development Company, owner and developer of King Abdullah Port, held its annual iftar in Jeddah. The iftar witnessed a wide array of guests including managers and stakeholders from the Economic Cities Authority, the Saudi Customs, the Border Guard, the Saudi Food and Drug Authority, the Saudi Standards, Metrology and Quality Organization, and the National Container Terminal Company, which is the main operator of container berths, in addition to representatives of a number of international shipping lines. Managing Director of the Port Development Company, Engineer Abdullah M. Hameedaddin, offered the attendees his congratulations on the occasion of the Holy month of Ramadan, praying to Allah that it would bless the Kingdom and all the Arab and Islamic nations. “We organize this event based on our strategy to enhance and support communication between us and all the entities operating and shareholding in King Abdullah Port and participating in its achievements on all levels. It is certain that the beautiful atmosphere in this Holy month will help connect those working in different sectors together and inspire a spirit of cooperation amongst them,” Hameedaddin said. He also praised the prominent role and outstanding efforts of all the partners in the operating sectors and their support for King Abdullah Port’s developmental journey, as well as the proud achievements the Port has accomplished in record time. Eng. Hameedaddin stressed the importance of exerting more effort and hard work to enhance the port’s services and improve its performance in order to promote the significant role it plays along with all other Saudi ports in advancing the national economy. He also stressed King Abdullah Port’s commitment to participate in achieving the Saudi Vision 2030 by activating the private sector’s role in developing and diversifying the Kingdom’s economy. During his speech, Eng. Hameedaddin highlighted King Abdullah Port’s achievements during the past year, which, he said, would not have occurred if it were not for the combined efforts of all the operating and participating entities in the port. He mentioned King Abdullah Port’s annual cargo capacity, which reached three million TEU, in addition to the annual container throughput that reached 1.3 million TEU at the end of 2015. Run by the Ports Development Company, King Abdullah Port is the Kingdom’s first port to be fully owned, developed and operated by the private sector. With its strategic location and state-of-the-art technologies, all managed by national and global experts who strive to offer the best possible services, King Abdullah Port has earned its place at the heart of the world’s major shipping lines, all within a solid plan that will bring its vision of becoming one of the world’s largest ports to reality.